The private Turkish vehicles manufacturer Nurol Makina signed a memorandum-of-understanding (MoU) with Uzbekistan’s UzAuto to co-produce 1,000 of Nurol Makina’s Ejder Yalçın 4×4 armoured vehicles. The MoU was signed on Thursday, October 26. 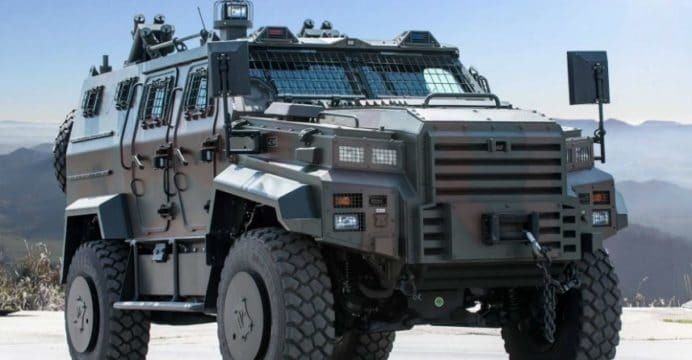 According to the Daily Sabah, the deal involves 24 already-built vehicles along with rights for UzAuto to re-export the Ejder Yalçın 4×4 light armoured vehicle to third-party countries. The Daily Sahab reports that Nurol Makina was selected over Russian and Chinese competitors over price. By mid-2017, Nurol Makina sold 250 Ejder Yalçın in Turkey to the Turkish police and Turkish Armed Forces. In terms of exports, Uzbekistan follows Tunisia as the second overseas operator of the Ejder Yalçın. Nurol Makina designed the Ejder Yalçın for internal security and military requirements. The Ejder Yalçın could be adapted for many roles, including border security, air defence, reconnaissance, command-and-control, personnel carrier, tactical missile carriage/launch, armoured ambulance and more. The Ejder Yalçın can reach a top speed of 120 km/h and a range of 700 km. It has a gross-weight of 14,000 kg and is capable of ferrying a payload of 4,000 kg. In terms defensibility, the Ejder Yalçın offers STANAG 4569 Level 3B or Level 4A mine protection under the chassis. Primary armament options include one of either a 7.62×51 mm or 12.7 mm machine gun, while secondary weapon options include a 25 mm anti-aircraft gun or 40 mm automatic grenade launcher. Nurol Makina belongs to Nurol Holding, which is also owns 51% of FNSS Savunma Sistemleri A.Ş. (which is co-owned by BAE Systems). Nurol Makina is among an increasing number of Turkish manufacturers with 4×4 light armoured vehicle platforms. Competitors include Otokar (Cobra II), TÜMOSAN (Pusat) and BMC (Vuran 4×4 and Kirpi). For Central Asia, Nurol Makina is also competing with South Africa’s Paramount Group, which has a partnership in Kazakhstan under the Kazakhstan Paramount Engineering venture.